So here we are. Week away from our big move. This means this is my last post written in Ireland, going forward I will harass you with Hong Kong, Asia and Poland related content – I noticed I write way too little about Poland despite having such a rich culture and history. In meantime, I want to help out all the people who think about immigrating to Ireland. Our move was bit heat of a moment – in the US we were in immigration jail, my career perspective was not really good, Ireland was much closer to at least one part of our family so when I read ‘Limerick is fourth biggest city in Ireland’, I thought ‘Wroclaw is the fourth biggest city in Poland, so it should be fine’. It wasn’t – my expectations were completely different, and it only my fault for not doing my research right. So keeping in mind how big deal Brexit is to many people, especially for those who consider moving to European English-speaking country, Ireland may be the destination. Job market – it’s actually a great time to move to Ireland. Many companies are transferring offices from UK to Ireland so organisations look for staff. Currently Ireland has its lowest unemployment rate since 2008. Salaries – salaries are good, especially for skilled workers, but the downside are really large taxes. Just to put it in an example: Sing in Ireland earns XXXXX, I earn YYYYY. After moving to Hong Kong his monthly salary will be slightly lower, while my salary will be out of the picture until I can sort out my status etc. Even if I decide not to work, due to taxes etc. the difference of money on hand we kept in Ireland versus what we’re going to keep in Hong Kong is 800 Euro per year. That’s 2 Euro per day, not counting money from bonuses. Basically my whole salary was to cover the Irish taxes. Another example: a guy at our (still) workplace counted that salary difference for working 4 days a week and 5 days a week after taxes if 9 Euros. Cost of living – you would be surprised, but living in Dublin can be more expensive than living in London. Good fish and chips in London will cost you 9 GBP, while in Dublin it will be difficult to find a good one under 15 Euro – you can find a cheap one, but it probably won’t be good. Transportation and housing is expensive as well. Especially with housing crisis in place, finding a decent place can cost you thousands. Government support – if you work for two years you are entitled to many types of welfare or government support. On the other hand, you often need to be unemployed to benefit from them. Keep in mind if you own your business (whatever it is), you’re most likely not entitled to any of these, despite paying taxes. A lady I know owns nail and beauty business, she doesn’t earn millions, but the government puts her in the same position like CEOs of big companies. She cannot get a sick leave nor partial-payment for her daughter’s school uniform as she’s self-employed. Weather – this is a huge bummer, and I’m serious about it. If you’re like me, and you get moody with the weather changes, I would not recommend you move here. It’s not uncommon to be sensitive to bad weather in terms of mood, and I know many times I just felt so down, with no energy to do anything. Especially on West coast with strong winds and loads of rain for most of the year, it can make you feel powerless and frustrated. Entertainment – unless you’re a fan of pubs and slowlife, or live in Dublin, you’re choice of entertainment with be very limited. Even largest cities in Ireland focus on pub/bar culture, there are some places to eat, but the variety is not really large. Especially if you’re fan of East and South Asian food you may find it problematic to find a place to eat. For pool table or karaoke room you need to look in Dublin, I haven’t seen it in other cities, but I may be wrong. And the most important thing: THERE’S NO BOBA TEA OUTSIDE OF DUBLIN. I think that’s enough to make up your mind. Racism – until last few month I would say that despite being a conservative country it’s not really a racist place, but recently we had few encounters that were just disappointing.Sing has been called ‘Jackie Chan’ in the club, and the other time we were selling things online and simply didn’t want to exchange a TV for a phone so some random guy called him ‘Bruce Lee’. It wasn’t a situation that would make you scared for your life, but it shows that it’s still somewhere there. Luckily, despite situations like this (surprisingly, these were said by young fellows and not some old grumpy man who wants to see Ireland great again) Ireland is pretty peaceful and opened. And I think I would be less mad if he called him Andy Lau or something, at least he would be bit creative in his offense. Travelling – it will be expensive. While in mainland Europe or in the UK you can use a car (and drive on land or through tunnel), the only way out of Ireland is by airplane or by boat. Even with Ryanair and other cheap lines travelling outside of Ireland is expensive as you have no other alternative. It’s even worse in case of emergency when you don’t have any time and you need to buy the ticket – 30h long journey from Ireland to Iceland to Germany to Poland costed around 600 Euro, all the direct connections were sold out. Christmas tickets directly to Poland – 700 Euro or more. Our Hong Kong tickets with Finnair were below 300 Euro – that says a lot. 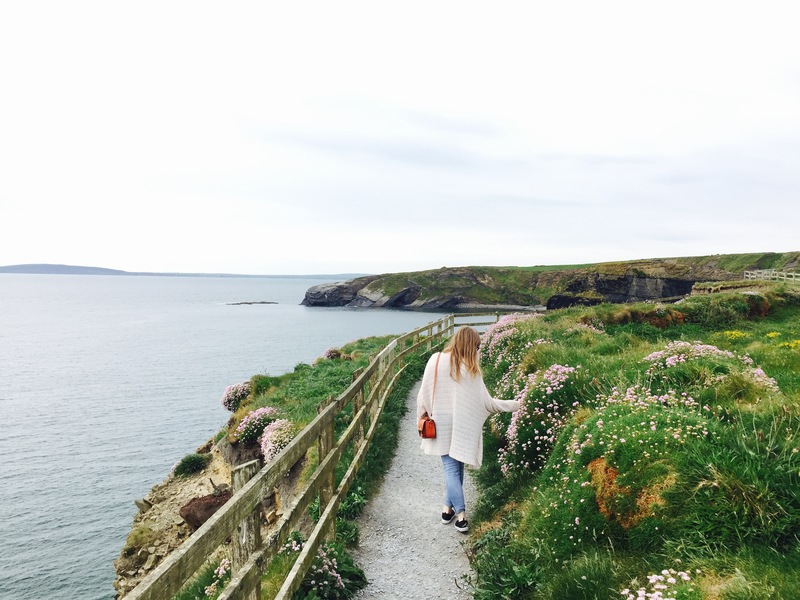 Ireland’s nature – it’s beautiful, it really is. High cliffs, blue water, fields full of sheep and cows. It has its climate. I got bored of it after a year, but I know many people still fascinated by the views even after living here for years (F., I’m looking at you!). Even if you don’t want to move to Ireland, I think it’s still really special place to visit – not a place I could call home, but definitely a destination worth seeing. Let us know if you have any further questions on living or emigrating to Ireland, we would love to help you out! Also, if you have any suggestion on future content I’m very opened to hear them! I write this blog not only for myself, but mostly for you guys. If you want to learn more about Poland or you want to hear about life in Hong Kong, I will be very happy to share it with you guys! I went to Wroclaw last Christmas, it was a very nice town! Could you share your experience while working in there? I’m so glad you liked it! Did you have a chance to visit the Christmas market? Are you interested only in working side of Wroclaw, or also living? Hope you will visit it more often! Very interesting post. I’ve heard good things about Ireland but it seems there are quite a few drawbacks. I would imagine that the two of you not being from Ireland also might have been a factor too. Anyways, have a good move back to HK. Yes, some young white males int he U.S. are now comfortable being openly racist, too. Thanks, Donald Trump, for Making Racism Great Again. I’ve seen the videos lately, makes me want to puke. Brain-dead assholes. You gave an interesting summary of life in Ireland. The entertainment possibilities don’t sound very enticing, and it sounds like too much rain. Enjoy Hong Kong. I’m sure you will. I have a question! Your use of written Chinese is pretty good, especially with traditional characters! How did you go about learning, did you take classes? As I mentioned in your blog four years ago, the British Isles are the place for miserable weather. The only fight can be done from the inside! 🙂 you know my stand on HK’s independence! Very intriguing! I didn’t know that Ireland now beats UK in minimizing the unemployment rate. The part about NO BOBA TEA outside Dublin cracked me up. Are you serious? So in Dublin, are there plenty of options? I cannot survive without Boba teas. Racism encounters are sadly omnipresent no matter where we go. But it’s very distressing to read about your encounter in public places like pubs. You would think as people are more educated, they would be instilled with openness and acceptance of differences, equality…guess not.